This morning I did the Lesser Invocation Ritual Of The Pentagram, although I would rather call it Evocation than Invocation. Why? Invocation means that the spirit or Entity will be manifesting inside an object, say for example a Magick Mirror, Crystal Ball, Bowl Of Water or yourself. Evocation means that the spirit or Entity will be manifesting before you, in the same room as you in physical form ether visible to you or not. As I was working with the four Guardian Angels of the four cardinal directions in this ritual, I was not Invoking them into anything. Some people have said that when calling upon the Guardian Angels they are really only showing as a thought form. That maybe the case with these people, however with me they are really showing their presence before me at each cardinal direction so it`s Evocation. I will show you evidence of this as we read through this article of mine. The Lesser Invocation Ritual Of The Pentagram is much the same as The Lesser Banishing Ritual Of The Pentagram. So if you have learn`t the LBRP to memory then there is not that much that needs to be changed. 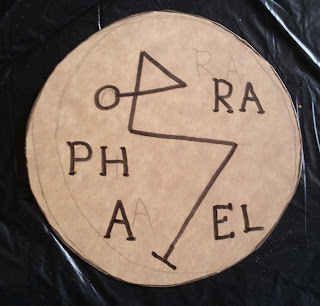 The only things that are different in this ritual is that I am using a Invoking Pentagram rather than a Banishing Pentagram and that the Guardian Angels of the four cardinal directions are facing inward where as in the LBRP they can be facing outward. 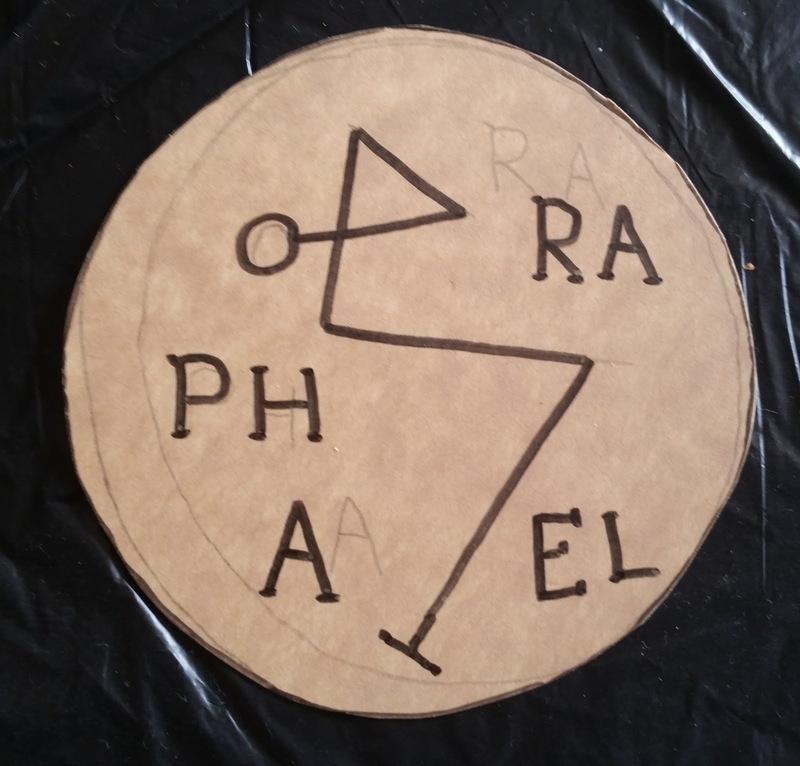 Just as in the LBRP I am working with an Earth Pentagram, but it will be the Invoking Earth Pentagram. To see all the Banishing and Invoking Pentagrams of each cardinal direction please see my other article The Lesser Banishing Ritual Of The Pentagram. 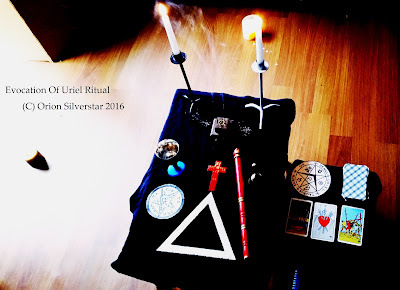 So in this ritual, The Lesser Invoking Ritual Of The Pentagram i`m using the Earth Invoking Pentagram for all four cardinal directions. This means that I am calling on the energy of Archangel Uriel, as Uriel is in the direction of Earth. This does not mean that I can not communicate with the other Archangels/Guardian Angels, I can. It is just that I am putting it out there to Uriel that I wish to seek their Wisdom/Knowledge by using the Invoking Pentagram Of Earth. 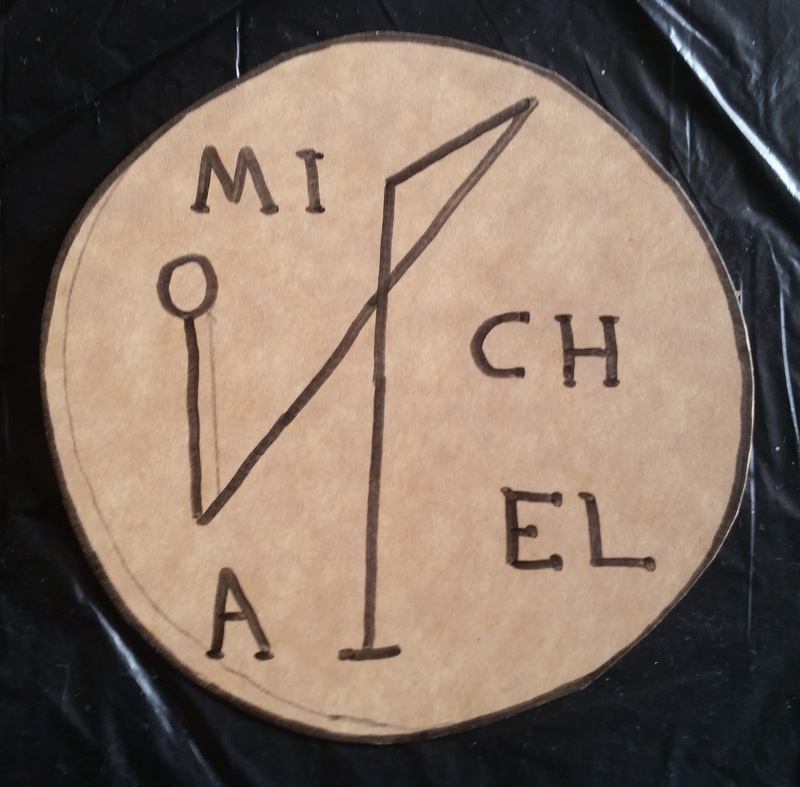 If I wished to get the attention of say Guardian Angel Michael more, I would use the Invoking Pentagram Of Fire for all four cardinal directions in this ritual. Here is The Invoking Pentagram Of Earth, as I say to see all the Invoking and Banishing Pentagrams for each cardinal directions please see my other article. 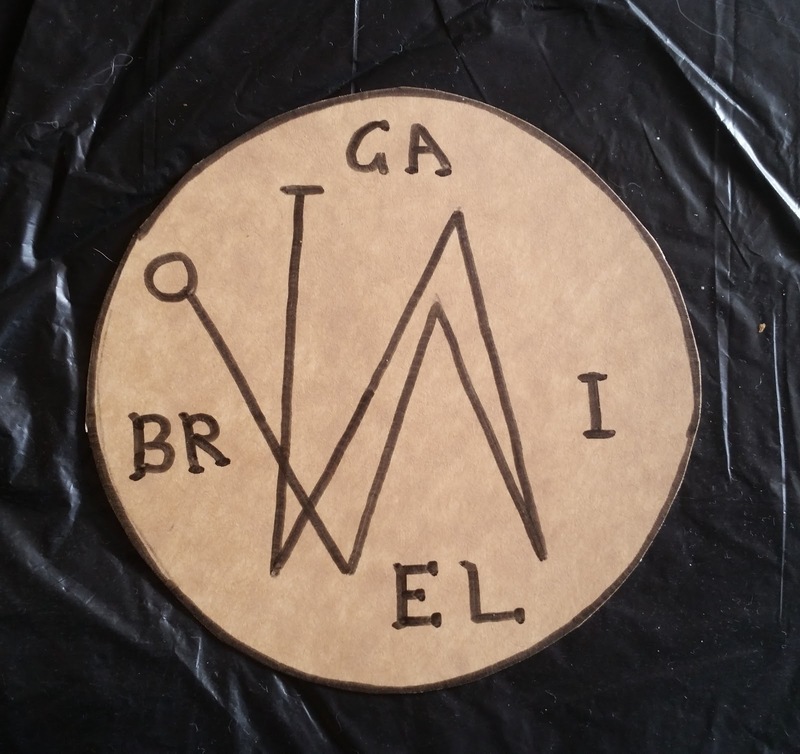 On doing this ritual, The Lesser Invoking Ritual Of The Pentagram (LIRP) it is important to do the Lesser Banishing Ritual Of The Pentagram first. Before Evoking or Invoking anything the Banishing ritual needs to first be done to clear out any unwanted influences around. It is important to do the Lesser Banishing Ritual Of The Pentagram regularly as it is very powerful. However also the Lesser Invoking Ritual Of The Pentagram should be done regularly for balance of energies. Not only this but the Lesser Invoking Ritual Of The Pentagram keeps the energies of the Guardian Angels around after negative energies have been banished. If the Guardian Angels are unable to stay around and most often this is the case, given their authority they will send other Angels under them to be around you as you go through the day. Here is a Talisman I made for the Element of Earth. As you can see, it not only is Archangel Uriel but it is Venus or you could say the Lucifer (the bright morning star), it is also Taurus the Bull or Ox which is one of the four Living Creatures featured in The Revelations (The Bible) and also seen on the Wait Tarot Card "Wheel Of Fortune". The symbols and Sigils I have also added all relate the this element Earth and is cardinal direction North. 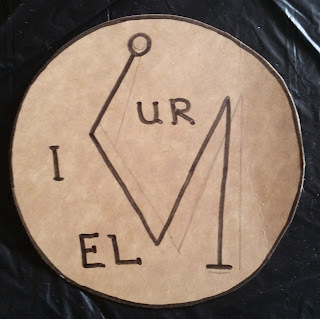 There is the symbol of earth, the symbol of Taurus, the Sigil of Uriel through using the Rose Cross, the symbol of the earth which is a circle with an X in it which also relates to the Ox. 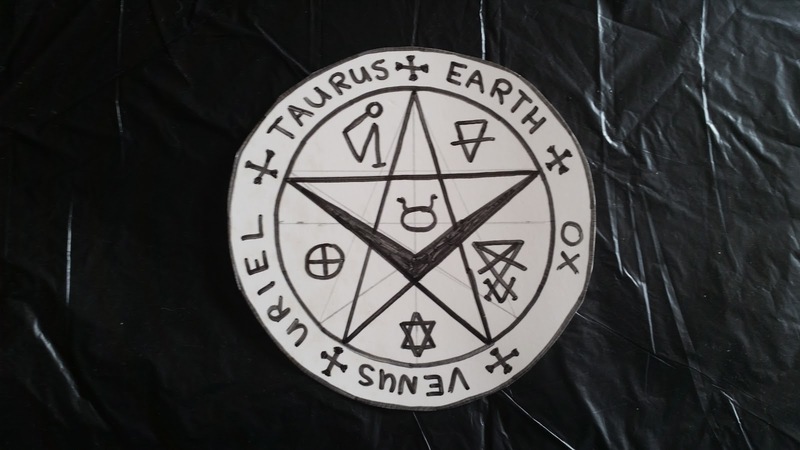 The cup sigil of Venus (the Lucifer) and also the earth pentacle that represents all four elements, plus spirit. I am in the process of doing another Talisman but involving the use of colour also. Here are some sigils I made for each Archangel of the four cardinal directions with the help of the Rose Cross. Here is a photo of my altar from this mornings ritual, as you can see I was using my Tarot cards as a divination tool to communicate with the Archangel Uriel. Here is another photo of my altar from this mornings ritual, where I am able to show you something you maybe seeing for the first time. The presence of Guardian Angel Uriel in the form of a Green ball of energy (in the green circle). Green is the colour of Earth which is the element to which Guardian Angel Uriel is connected with. You may need to zoom the photo`s in more closer to get a better look. You may think that this photo is just by chance that there happens to be a green orb in my circle. I also might think this if I had never been in the presence of the Archangels directly. 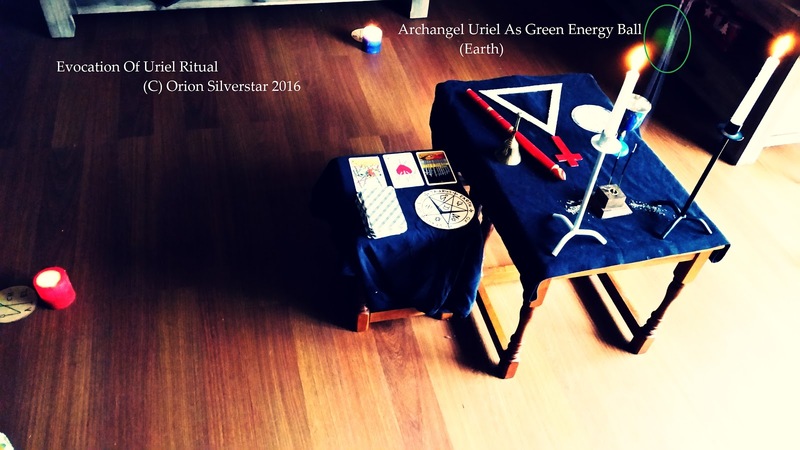 Here is a photo of my altar from a month ago where I was performing The Lesser Banishing Ritual Of The Pentagram (Earth). Archangel Uriel shows again as a Green ball of energy, this time in a different position, in the East and not far from where Raphael was positioned (red circle). The thing is a lot of people think that the Archangels stay in their quarters and that`s it. This is wrong, from my experience they are free to move around the circle as they wish and do so often. I also wish to say these rituals are very powerful and not for those people that wish to dabble or want to try them out to see what happens. I would also advise not to do The Lesser Invoking Ritual Of The Pentagram just before bed as you may not get a good nights sleep. Any questions, please feel free to send me a comment at the bottom of this article thanks ~ (C) Orion Silverstar 2016. Hi Saints Above, thanks for your comment. My altar is setup to the Hermetic Order Of The Golden Dawn, however I use other methods and traditions of Magick. I never work with one kind of ceremonial High Magick or esoteric formula as that limits things a lot. I like to say that really I do not follow any one religion ether as again it restricts a persons spiritual growth on the path to illumination by following just one set of teachings. In all religions and esoteric workings there is good things and bad. I ask my guides to show me that which I can use and to protect me from using a mystical formula that will bring me harm. Having had a background in Witchcraft or Wicca as it is called these days I will still use this in my workings. Anything that I find works and empowers my rituals and deepens my connection with the higher powers that be. As high magick involves a lot of ceremony I still like to stay grounded through working with the nature and the elements. I`m sorry to hear that you found my description on the use of the different pentacles confusing. 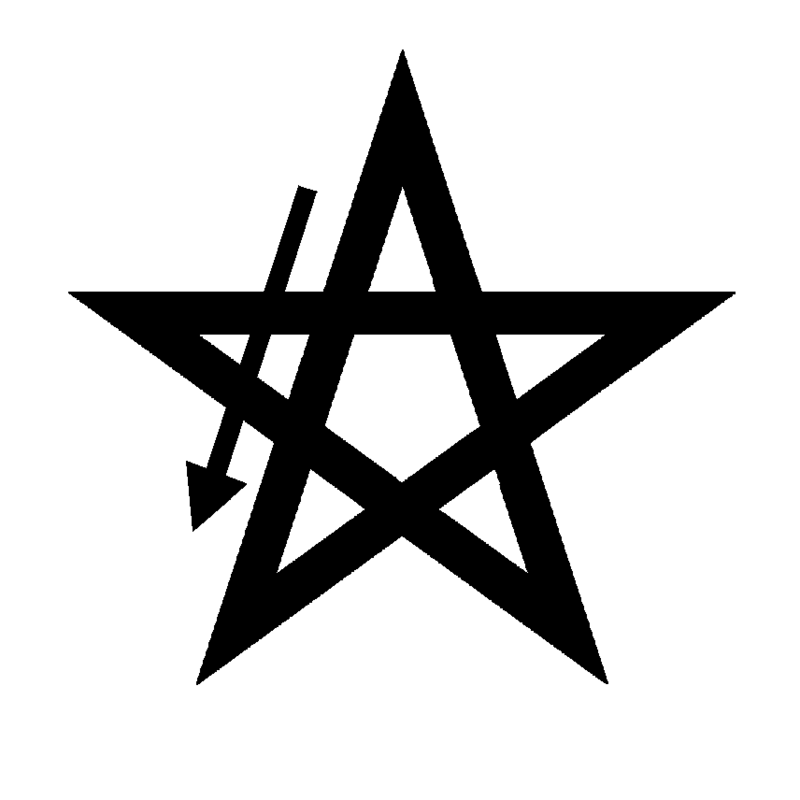 Thank you for that feed back as it all helps when it comes to writing more in the future :) I have decided that what I will do is write a blog related to the different pentacles and how it works in ritual, plus some history behind the pentagrams use through esoteric spiritual work. When it comes to Hollywood movies and TV shows, they are far from the truth. It is thanks to things like horror movies that have made people fear the occult or the paranormal. Don`t get me wrong there can be many dangers for the dabbler, the untrained, the skeptic and someone jumping in to fast. All of what I have shared here will help someone empower the environment around them in a positive way. If you have anymore questions please feel free to ask me ~ Orion. I'm sorry I let you go on FB. But I've sent you a friend request again and I hope you accept it for good. I was scared at what I was reading. I'm interested in reading of it but never the guts to try it out. I have my own little gift. I can sense spirits near by when they want to be attentive. Especially the not so good ones. I get light headed and sick in the pit of my stomach. I've gotten quite a few responses from those not so good spirits and my visions only occur once in a very great while. But when those visions occur, they are very broad i guess you can say, never wrong and I never go against them. These visions can happy anytime and may not be quite accurate but close enough to what may occur. I do have 2 friends up north whom are Pagans. To be honest, it blew my mind that they would do that, but then again, they were always the out going types, lol. I started to read on the Paganism and Wickins. It is intriguing but then so is reading of the Ouija board though I would never try it myself alone for that matter. Just reading this stuff does broaden my imagination and wanting to know its origin, its history. I found a man whom wrote Satan's Bible. Not sure what to think of that, can't make heads or tails on it yet. I'm also picking up reading materials on Voo Doo. Just to learn the origin and its history. Never to indulge. I hope we can become friends again on FB, like I said, I am scared of knowing the truth yet I want to know the truth (if that makes any sense, lol ).